1 Level Select At the Options screen, select the Sound Test and play the following sounds in this order: 8, 4, 19, 70 (press A to play each sound). The screen will flash. Exit the Options screen and begin a new game. 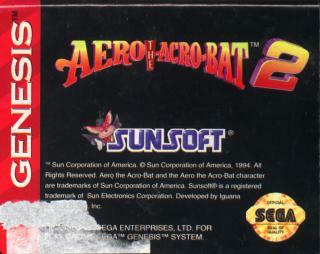 Pause the game and simultaneously press and hold Down, A, and C. A Level Select screen will appear. sense of duty and loyalty seem strangly misplaced. This game is so fun but I only got to level 3 though but I like it! Call me a purist, but this is just another pretty side scroller with no content. Not very impressive. WHAT IS THE KEY TO THE LAST BOARD TO SHUT OFF THE ELECTRICITY? There are endless clones of the Sonic the Hedgehog series for the Sega Genesis. This is yet another failed attempt, featuring effortless, bland level design, been-there-done-that graphics, and the overall premise causes a yawn or two. 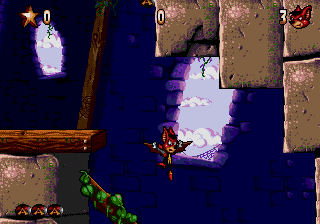 I appreciate a decent platformer, even clones of the Sonic series, but this one definitely does not earn my respect. Stay far away from dear old Aero. One of the most enjoyable characters I've ever seen hit both Nintendo and Sega. 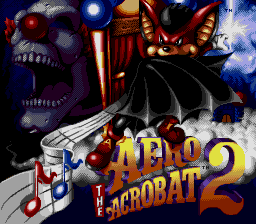 Aero's drill attack is interesting, and his animations and voice in the second game are better then Micky Mouse. 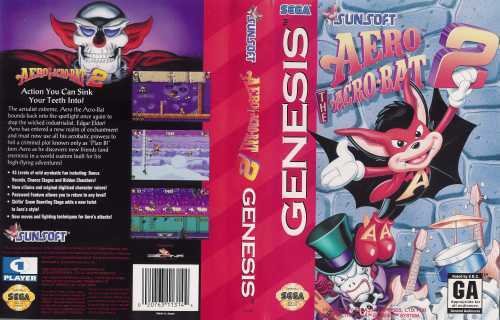 Sadly, this game is largely disrespected as a Sonic clone(If that were the case, don't you think Aero would be faster?) or "Just another platform game" (As if there was anything wrong with platform games to begin with. ), and those who think this often shut their eyes to the true beauty of the game. It's a real challange- with enemies galore and very little allowance for mistakes in the latter levels.